Flamm's New Index Map Baltimore. 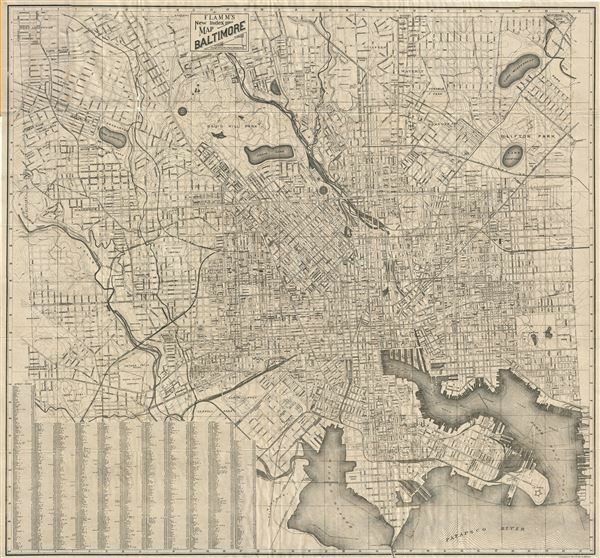 This is a fine example of a 1913 map of Baltimore, Maryland by William A. Flamm. It covers from Montebello Park to Fort McHenry. The map is exceptionally detailed noting important buildings, streets, parks, lakes, cemeteries, railroads, and other topographical features. A street index is included in the lower left quadrant. This map is copyrighted 1913 by Wm. A. Flamm, Baltimore, Md., and is engraved by the Maryland Litho. Co., Baltimore. Very good. Minor wear and verso repair along original fold lines. Blank on verso. Folds into original cardboard binder.